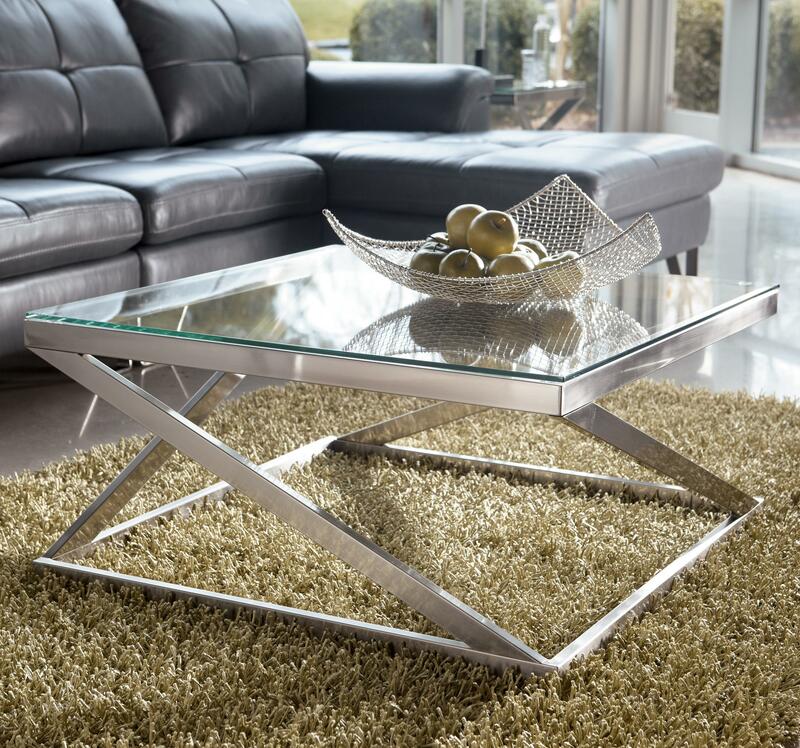 The sleek and minimalist contemporary style of this square cocktail table exemplifies the clean lines that will add modern styling to showcase at the center of your living room. The angled tubular metal legs in a brushed nickel color finish and square frame at the base provide beautiful symmetry to the look. The framed metal also supported the clear tempered glass top. The tempered glass top features a beveled and polished edge for a finishing touch. Easy to clean and right on trend you will love the look of this coffee table in your home. 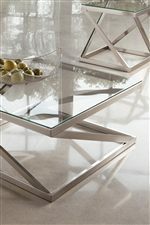 The Coylin Brushed Metal Square Cocktail Table with Clear Tempered Glass Top by Rooms Collection Three at Rooms Furniture in the Houston, Sugar Land, Katy, Missouri City, Texas area. Product availability may vary. Contact us for the most current availability on this product. Description: Top Clear tempered glass top with beveled and polished edge. Case Construction Made with tubular metal in a brushed nickel color finish. The Coylin collection is a great option if you are looking for Glam Contemporary furniture in the Houston, Sugar Land, Katy, Missouri City, Texas area. Browse other items in the Coylin collection from Rooms Furniture in the Houston, Sugar Land, Katy, Missouri City, Texas area.